April 14th, 2016 will mark the clash between Suriya and Vijay this summer. 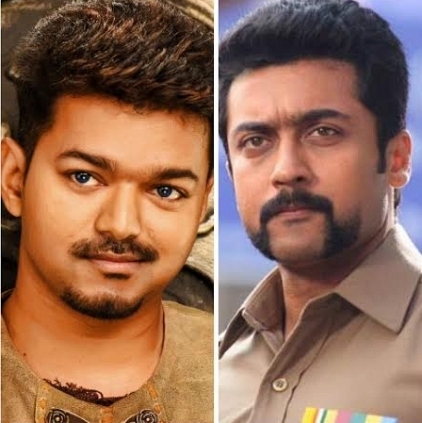 Suriya's time travel rendezvous 24 will release against Vijay's action cop thriller Theri midst soaring expectations. Given the fact that Theri is directed by Atlee of Raja Rani fame and that the venture showcases Vijay in a completely different avatar, fans are going crazy awaiting it. 24 has music by Oscar nayagan, AR Rahman and the recently released first look posters of the venture are already going viral on all social platforms. Suriya and Vijay have also acted together in Nerukku Ner and Friends previously.The duo fought against each other at the ticket window during the celebrations of Diwali 2011 as well. Luckily, both '7aam arivu' and 'Velayudham' turned out to be good runners at the box-office. Guess we'll have to wait and see on who will win the race of 2016! What do you think? Let us know in comments below! Dhanush to make a Hollywood debut! Suriya Confirms That 24 Is A Double-action Subject. List Of Films Releasing On 24th December. People looking for online information on 24, Suriya, Tamil new year, Theri, Vijay will find this news story useful.